Competitive interactions can be manipulated in the laboratory or in the field, conditional on the ingenuity of the investigator to construct an experiment that allows realistic interactions and reveals the mechanisms involved. Laboratory experiments usually offer the greatest experimental control and can be particularly useful in demonstrating the potential for competition and in identifying mechanisms. Field experiments at least in principle offer greater realism, although they too have artifacts and their outcomes may be influenced by the relatively small scale and short timeframe of the typical field study. Investigators often have used a combination of labora tory and field experiments, and in some cases have exploited natural comparisons or unusual environmental events to provide evidence of competitive effects at large scale and under natural conditions. Both laboratory and field studies have shown interference competition and aggressive displacement of one species by another. Baltz et al. (1982) found riffle sculpin to be most abundant in the upper reaches of a small California stream, while speckled dace dominated riffles downstream, and the two species were inversely related over the 12.5 km section. Laboratory studies demonstrated that dace avoided areas occupied by sculpins, but also tolerated warmer temperatures, which presumably explains the downstream prevalence of dace. Interference competition is well documented in space-limited taxa of invertebrates. Large size almost invariably conveys an advantage, and the loser may be injured or cannibalized. In the latter instance the line blurs between competition and predation. Larvae of a netwinged midge (Blepharicera) and black flies (Simuliidae) compete for space on stone surfaces in swift-flowing small streams, even though the former feed on attached periphyton and the latter are primarily suspension feeders. Their densities were inversely correlated in a California stream, and behavioral observations of interactions revealed that larval black flies ''nipped'' at Blepharicera within reach, disrupting their feeding (Dudley et al. 1990). Ble-pharicera spent significantly less time feeding in the presence of black fly larvae, compared to when the investigators removed all simuliids within a 5 cm radius. Aggressive competitors such as caddis larvae affect other species by multiple mechanisms including interference, predation, behavioral avoidance, and by modifying flow patterns (Hemphill 1988). Small-scale density manipulations of Hydropsyche siltalai illustrate the multiple pathways of its influence in a lake outlet stream in north Sweden (Englund 1993). The presence of H. siltalai, a net-spinning filter feeder that aggressively monopolizes space, resulted in reduced numbers of the mayfly Ephemerella ignita and the black fly Simulium trun-catum, and increases in the free-living, predatory caddis Rhyacophila nubila and chironomid larvae. Direct mortality due to predation was the primary cause of declines, although hydropsychid nets likely also interfere with the attachment and feeding of simuiliid larvae. Increased abundances of R. nubila and chironomid larvae is somewhat surprising since they also are consumed by H. siltalai, but apparently hydropsychid nets enhanced food availability to these taxa, and so the presence of H. siltalai resulted in a positive facilitation. 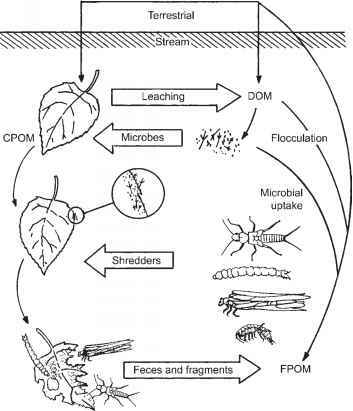 Strong competitive interactions involving stream macroinvertebrates have been demonstrated with sessile or slow-moving grazers, due to a combination of exploitation and interference competition. Snails of the family Pleurocer-idae appear to be competitive dominants in those headwater streams where they reach high abundances. Both Juga silicula in the northwestern United States and Elimia clavae-formis in the southeast have been reported to reach high densities and to make up >90% of the invertebrate biomass (Hawkins and Furnish 1987, Hill 1992). Snails can graze periphyton to very low levels, and because of their large size, individual snails also may harm other species by "bulldozing" over substrate surfaces. The interaction between Elimia clavaeformis and the caddis Neophylax etnieri in a headwater stream in Tennessee makes a strong case that the snails' influence is via exploitative competition (Hill 1992). High dietary overlap determined from gut analysis suggested that these two grazers were competing for periphyton. Both species substantially increased their growth rates and condition (ash-free dry mass per unit wet mass) when transferred from the stream to a high quality diet in the laboratory, suggesting food limitation in nature. In a natural experiment, Hill examined periphyton abundance and Neophy-lax condition in six streams lacking Elimia, and in six streams where the snail was abundant. Periphyton biomass was three times greater and caddis larvae at diapause roughly twice as large in the absence of snails (Figure 9.13). relatively low resource levels, and its stone case deters predation. By erecting barriers of petroleum jelly in a Montana stream, McAuliffe (1984a, b) was able to achieve approximately a fivefold reduction in Glossosoma densities, which resulted in a twofold increase in algal cell density. Mobile grazers such as Baetis were significantly more abundant in areas where Glossosoma was excluded. At normal densities Glossosoma appears to be able to reduce algal densities to levels where Baetis experiences resource limitation, and thus exploitation rather than interference is the primary mechanism. A 10-month exclusion experiment in a Michigan springbrook of very constant flow provides additional evidence of the community-wide effects of Glossosoma. Periphyton biomass increased substantially, as did the densities of most grazers (Kohler 1992). The majority of studies that document competition amongst benthic invertebrates in streams involve space-requiring filter feeders and slow, efficient grazers such as snails and Glossosoma. Systems dominated by highly mobile grazers of periphyton are common, and the extent to which these species compete with one another is less well known. However, laboratory studies demonstrate that depression of resource levels can limit food available to others of the same species. When Baetis tricaudatus and Glossosoma nigrior were allowed to compete for periphyton in laboratory stream channels, both strongly reduced periphyton abundances, suggesting that exploitative competition in nature was likely. Baetis had a greater impact on Glossosoma than the converse, and effects were seen mainly in terms of growth (Kohler 1992). When Hill and Knight (1987) manipulated numbers of the mayfly Ameletus validus in field enclosures, algal standing crop and the growth of A. validus both declined as its density increased. Collectively these studies demonstrate that competitive interactions indeed take place among macroinvertebrate assemblages of streams, but the extent and magnitude of com petitive effects in natural systems are not well resolved. However, observations that accompanied the collapse of Glossosoma nigrior populations in Michigan trout streams due to outbreaks of the microsporidian Cougourdella provide impressive documentation of the ecosystem-wide influence of a dominant grazer (Kohler and Wiley 1997). 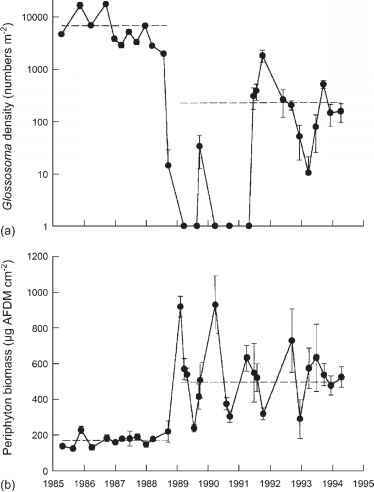 The pathogen-induced decline of Glossosoma resulted in marked increases in the biomass of periphyton (Figure 914) and in the abundance of most grazers and filter feeders (Figure 915). Remarkably, these changes dovetailed with results from Kohler's (1992) prior laboratory and field experiments in a stable, spring-fed stream where Glossosoma was the dominant grazer. Long-term exclusion of Glossosoma resulted in increases in periphyton biomass and in the abundance and growth of a number of other species of grazers including midge larvae, indicating that the caddis larva might influence other members of the assemblage through diffuse competition. Two sessile filter feeders, the black fly Simulium and the midge Rheotanytarsus, also increased in the Glossosoma exclusion, which may reflect interference competition from physical encounters with the more robust Glossosoma. Inspection of Figure 915 leaves little doubt that, in this system, competition from a dominant grazer has dramatic, system-wide consequences. It also is instructive that although all responses were in accord with results from previous, smaller-scale experiments, those studies underestimated the extent and magnitude of Glossosoma's influence. (Kuhara et al. 1999). For all of the above reasons, it is likely that the influence of competition within stream communities will vary among locations, over seasons, and between different species assemblages.